Vision: Ensure they do not outlive their assets; not be a burden to their family; pay for grandchildrens’ education; make charitable contributions to their church and alma maters. Awareness: Our analysis revealed they were above the confidence zone with a 99% probability of achieving their Vision if they continue their current path. Plan: In a live planning session we made adjustments to optimize their confidence score to 88%. Allowing them to reduce investment risk and spend more in retirement. Implement: Thrive Implemented their plan every step of the way. 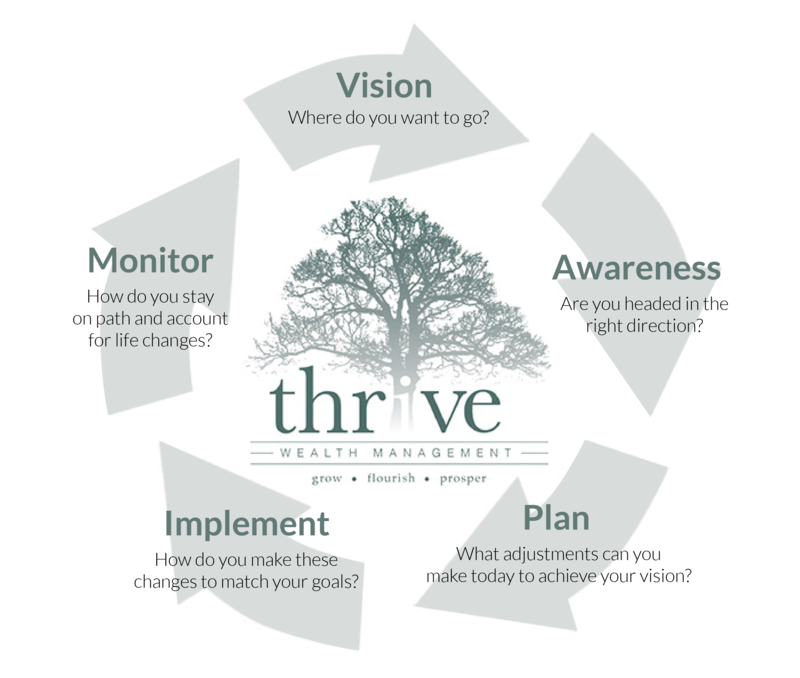 Monitor: Thrive continues to annually confirm their vision, test their plan, and hold them accountable so they stay on path. their church and alma maters, and increase their spending to include more travel. Investments: Reduced the overall risk in their portfolio. Consolidated many of their unnecessary investment accounts. Saved them $12k/year in fees by eliminating unproductive expensive investments and consolidating their relationship to one firm. Insurance: Utilized the accumulated cash value in their whole life policies to purchase a universal life contract providing a legacy for their daughter and a pool of money to cover their grandchildrens’ education. Purchased longterm care insurance. will allow her to defer hundreds of thousands of dollars in taxes. Taxes: Donated low cost basis stock to their church and alma maters saving $25k per year in taxes. The above is a hypothetical case study and not based on actual individual client results. The results achieved in our simulations do not guarantee future investment results. It is possible that the markets will perform better or worse than shown in the case study; that the actual results of an investor who invests in the manner these case studies suggest will be better or worse than the projections; and that an investor may lose money by investing in the manner the case studies suggest. The case studies assume the reinvestment of dividends and do not include transaction costs for purchases and sales of equities and bonds or mutual funds and ETFs. We assume no deduction for advisory fees, and that assets are allocated in the manner the projections suggest until the hypothetical client reaches age 95. The final results also address such factors such as annual spending, annual savings, timing and cost of goals. Although the information contained herein has been obtained from sources believed to be reliable, its accuracy and completeness cannot be guaranteed. While the case study results reflect rigorous application of the investment strategy selected, hypothetical results have certain limitations and should not be considered indicative of future results or results for any individual investor. In particular, they do not reflect actual trading in an account, so there is no guarantee that an actual account would have achieved these results shown. The 99% (before) and 88% (after) illustrated probabilities of success were derived from licensed forecasting software. The forecasting results are based on a Monte Carlo simulation. In addition to the facts listed in the case study: Investment assumptions in the “before” scenario include a 10.11% hypothetical average rate of return with a 16.80% standard deviation, while investment assumptions in the “after” scenario includes a 7.54% average hypothetical rate of return with a 5.86% standard deviation. Annual goal inflation assumptions include 3.0% for Retirement-Basic Living, 3.0% for Vacation Home, 3.0% for gifts, 3.0% for travel, and 6% for college funding. Marginal tax rate assumptions include 35% for federal and 3.07% for state. Long-term capital gains are taxed at 20%. A federal standard deduction of $24,000 was assumed. 85% of Social Security income was included as taxable income. Social Security income was estimated to be applied for at 70 years of age for both hypothetical clients. $52,800/year of social security income was assumed for each hypothetical client. Social Security income assumed inflation rate was 1.5% per year.